The Esri Roadmap for utilities and telecommunications companies was released approximately two years ago. This roadmap lays out the steps these organizations will have to take to equip themselves for the major updates coming in 2017 and beyond releases of GIS technology. These steps include upgrading, adopting a cloud platform, and becoming familiar with a new desktop application. 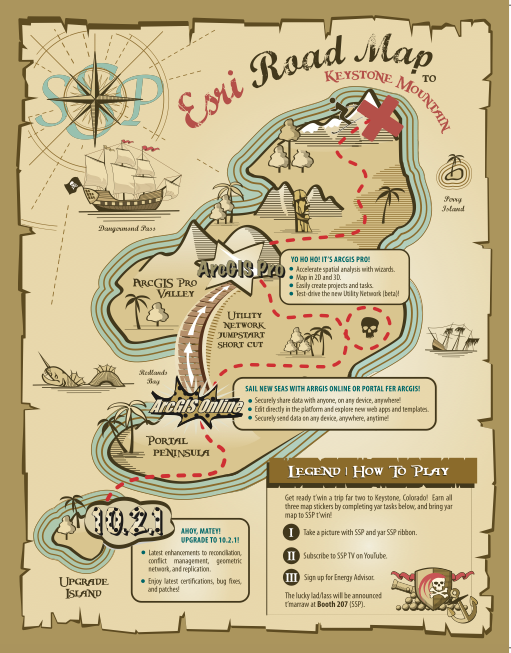 In this pirate-themed map, we explain those steps graphically with a good deal of creativity. The back of the map tells utilities and telcos what each step of the way entails, and the value propositions of why taking these steps is worth their time, effort and investment. In addition, the map is written totally in pirate speak. It was gamified to engage clients during a conference, during which one pirate-map participant won a trip to a private cabin in Keystone, Colorado. Avast! Download ye Treasure map here.